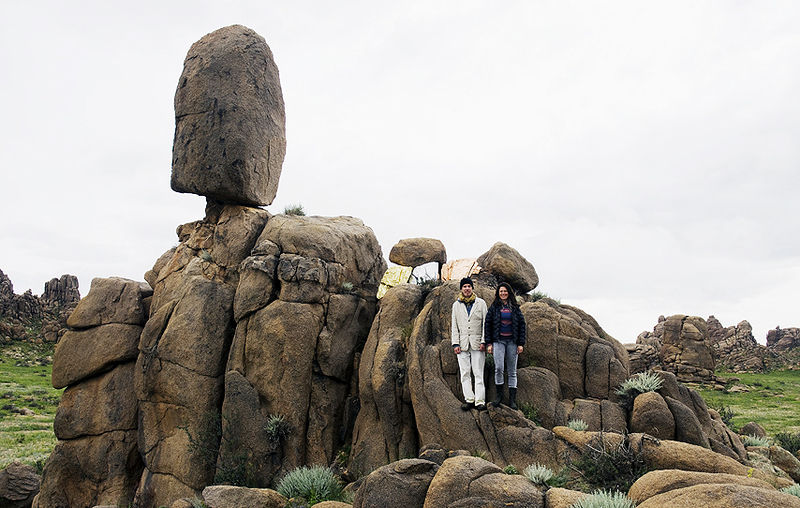 Art collective <a href="http://eco-baroque.com/" target="_blank">Eco-Baroque</a> recently traveled to the<a href="https://inhabitat.com/future-forest-plants-trees-in-the-mongolian-desert-to-reduce-korean-dust-storms/" target="_blank"> Gobi Desert</a> to infuse their magical land art into the Chinese landscape. 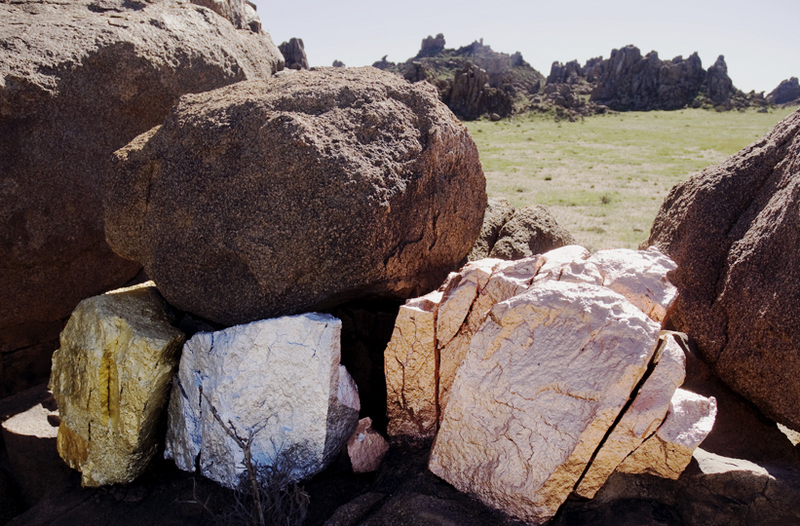 As part of the 2nd Land Art Biennial Mongolia 360, artists Marne Lucas and Bruce Conkle took inspiration from the gorgeous rocky terrain, highlighting the region’s natural beauty by applying removable gold foils to the ancient rocks. Their <a href="https://inhabitat.com/argentine-man-builds-giant-guitar-shaped-forest-to-commemorate-his-lost-wife/" target="_blank">land art sculptural installations</a> were then translated to film, as a body of photographs that combine the majestic land with the artist’s idyllic visions. 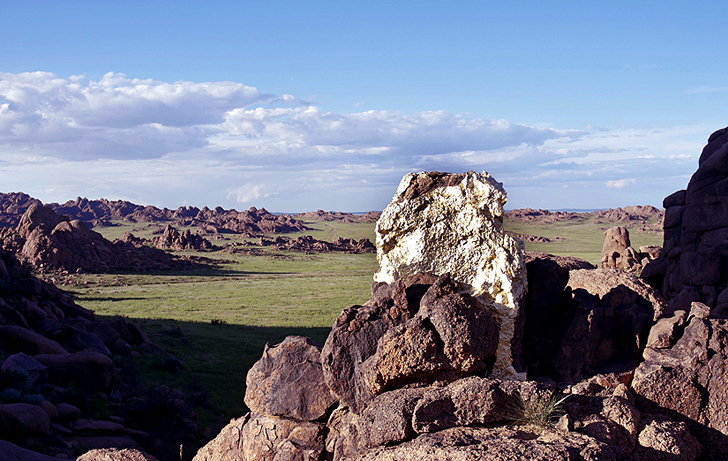 Lucas and Conkle lived for two weeks amongst the undeveloped lands of Mongolia, making site specific sculpture, video, installation and photography which was then exhibited at the Mongolian National Modern Art Gallery in Ulaanbataar. Dedicated to creating <a href="https://inhabitat.com/x-studios-lightweave-palm-observatory-is-made-entirely-from-palm-leaves/" target="_blank">environmentally-themed art works</a>, the duo expanded their repertoire across the globe, meshing their love of nature with their signature ornate aesthetic. 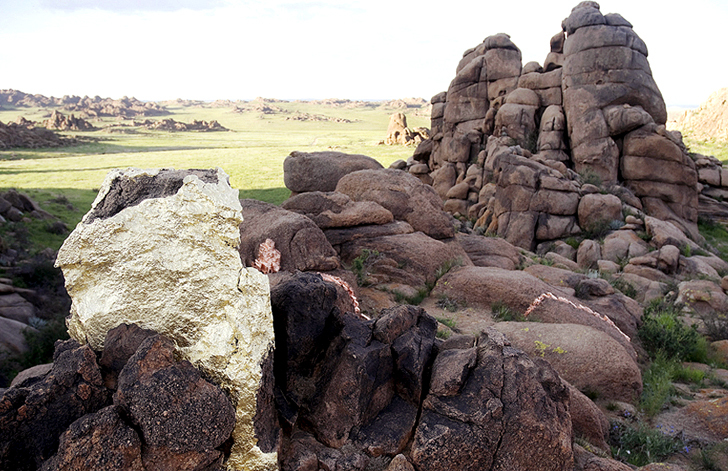 The artists spent days painstakingly applying gold leaf to <a href="https://inhabitat.com/mad-architects-complete-passive-solar-ordos-museum-inspired-by-the-gobi-desert/" target="_blank">Gobi Desert boulders</a> and small rocks alike, creating a relationship with first world decadence and the beauty of Mother Nature. The gilded landscape is meant to question the communication between mankind and the earth’s natural resources, energy, and bounty. The highlighted stones glisten and glitter in the desert sun, only enhancing an already magical landscape. 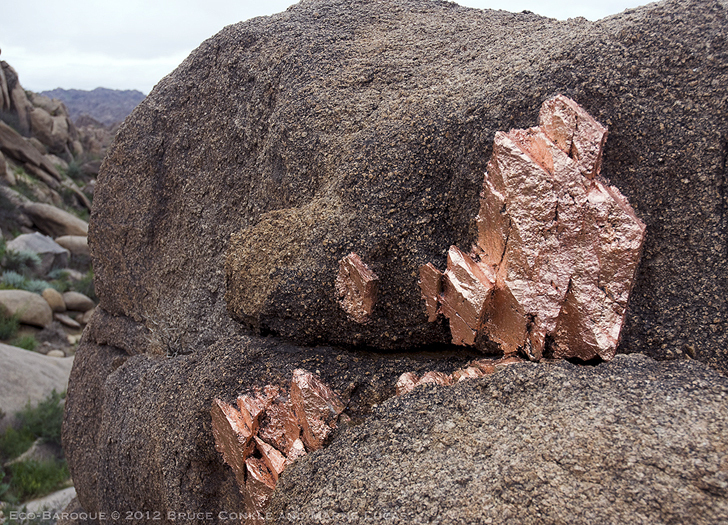 Eco-Baroque’s treatment of the Mongolian terraain was captured in photographs, before everything was scrubbed and returned to its untouched splendor. The collection also included gorgeous portraits of the local Mongolian people who call the vast area home. Art collective Eco-Baroque recently traveled to the Gobi Desert to infuse their magical land art into the Chinese landscape. 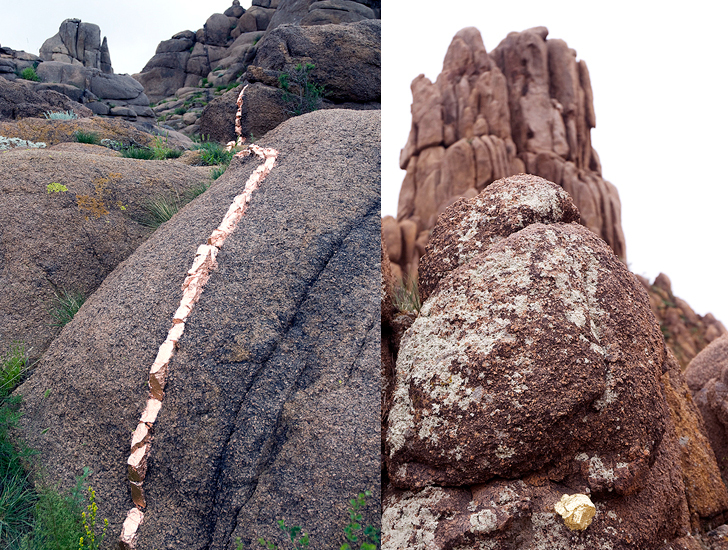 As part of the 2nd Land Art Biennial Mongolia 360, artists Marne Lucas and Bruce Conkle took inspiration from the gorgeous rocky terrain, highlighting the region’s natural beauty by applying removable gold foils to the ancient rocks. 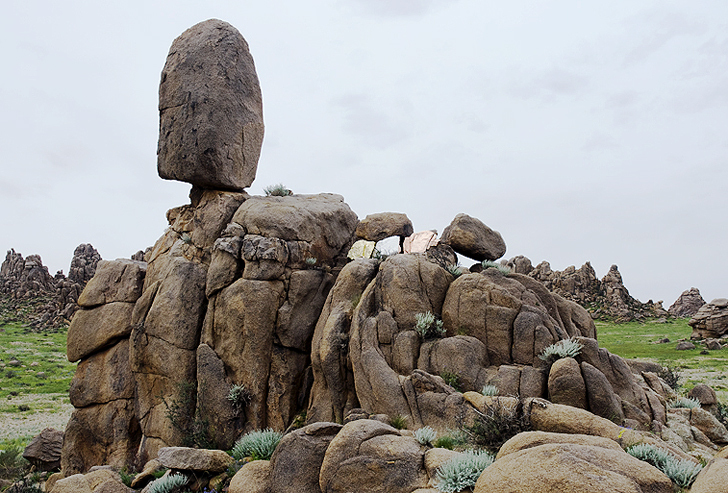 Their land art sculptural installations were then translated to film, as a body of photographs that combine the majestic land with the artist’s idyllic visions.